I need to locate an specific "struct" variable in the data section from an assembly. This structure is used for an specific System Function (Windows) "SetCommState()". I'm wondering how to locate the static data structure that are passed as argument to the function call. I'm ussing x64dbg for the disassembly and have the posibility to use snowman also. Here are the general steps you may follow to find any input variable of a function: 1. 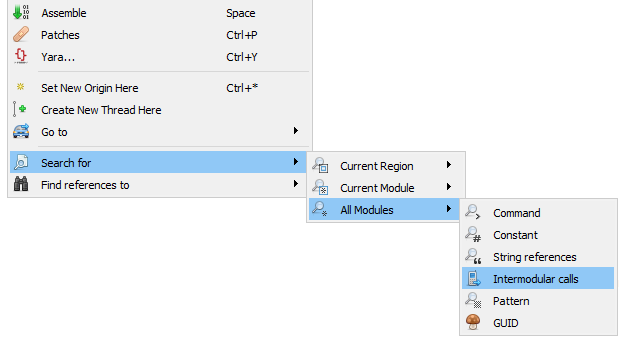 Find the imported function in the assembly (here SetCommState) 2. Find or guess the calling convention used in that function (here __fastcall) 3. If any parameter is a structure type find the stack pointer and/or base pointer offsets before the function call (here [rbp-48]). It will be the first member of that structure type variable. Then follow the stack allocations one by one, you will get all the structure members which are changed/accessed (here [rbp-48], [rbp-44], [rbp-30] and so on). To find the imported function (step #1) in x64dbg, load the executable in x64dbg. Right click on the disassembly window > Search for > All modules > Intermodular calls. Search the function name in search box below, here it will be SetCommState. x64dbg will show the specific address. Just double click on it and you can see the specific address. See this GitHub issue for reference. Not the answer you're looking for? Browse other questions tagged x86 x64dbg x86-64 or ask your own question.